Dapper Shopping has released its retail app Dapper on iOS devices, aimed at helping male smartphone users find and purchase stylish clothing items and accessories without using multiple shopping websites or apps to find the right item. 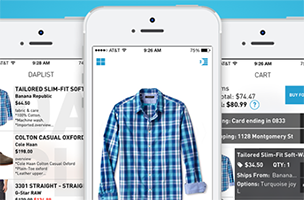 The app offers a catalog view of items based on occasion or style, and allows purchases from right within the app. Dapper offers different sections for office clothing, casual attire, activewear and more. Within each category, users can toggle their results to view a very specific kind of item. For instance, in the “Dressy” category, results for tops, accessories and shoes could be turned off, leaving just pants as the search result. The app offers items from multiple retailers, including Old Navy, Banana Republic and Gap, and allows users to add multiple items to their cart, regardless of store. Users can choose the color, size and quantity of their items, before heading to their cart to finalize the purchase. Once the purchase is complete, users receive order confirmation emails and shipping updates from those retailers as normal, as though they had made the purchase directly through those individual websites. The more users shop with Dapper, the smarter the app becomes, offering recommendations during future shopping trips. Additional retailers and brands are being planned for inclusion in the future. Dapper Shopping has raised $500,000 in seed funding for the launch of its app, which is now available to download for free on iOS. Check back soon to follow Dapper on AppData, our tracking platform for mobile and social apps and developers.